Success in business and in life is embodied in the interpersonal relationships we make. Time-tested tips and techniques for building power relationships that will last a lifetime. Success doesn’t happen by accident. The habits of success must be learned and practiced until they become permanent. Developing people skills, personality, and the ability to communicate will change your life for the better, forever. 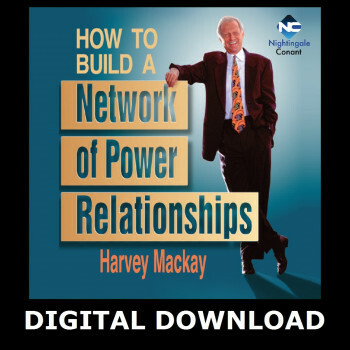 In How to Build a Network of Power Relationships, world-renowned author Harvey Mackay reveals that success in business and in life is embodied in the interpersonal relationships we make. The most important word in the dictionary is people, Mackay tells us. If I had to name the single characteristic shared by all truly successful individuals, I'd say it's the ability to create and nurture a network of contacts. While Harvey can't promise you a whole new personality, he can train you in his time-tested tips and techniques for building power relationships that will last a lifetime. Success doesn't happen by accident. The habits of success must be learned and practiced until they become permanent. Developing people skills, personality, and the ability to communicate will change your life for the better, forever. To succeed in business, or any arena, you must be able to make things happen. You have to think big, think bold, think creatively, think in quantum leaps. The key to seeing around corners is to tap into the eyes, ears, hearts, and minds of the people who can help you the most the people who are part of your personal network. Remember, we all start out in life with one thing in common: we all have the same amount of time…it's just a matter of what we do with it. The best way we can spend our precious time is on our relationships. Life is a challenge. Finding a job, raising a child, finishing school, getting a promotion, achieving our goals everyday we have to beat the odds in a complicated world. Fortunately, we are not alone. Other people are there, willing and able to lend a hand. All we have to do is ask. In the long run, we will only be as strong and as successful as our relationships.